Speedy Lohr’s of Arcadia, Lexington NC – Marie, Let's Eat! On my previous solo trips through North Carolina, I’ve had the pleasure of enjoying the “tray” style of barbecue with red slaw. This was Marie’s first opportunity to enjoy Lexington-style barbecue in the way it’s most commonly served. 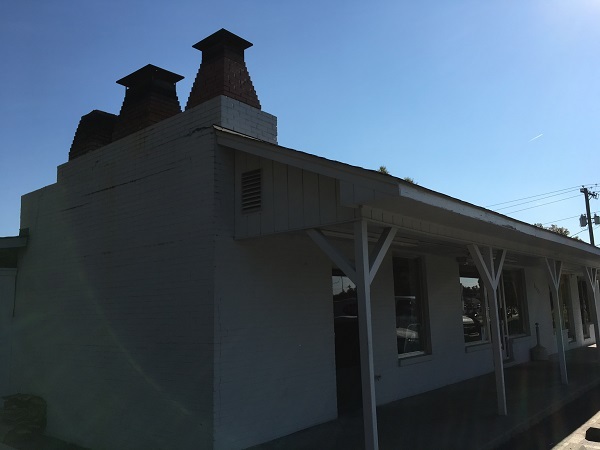 Arcadia is a little unincorporated community on the outskirts of Lexington, and for many years, Roger Lohr ran a little business there called Arcadia Barbecue. Roger is a second-generation pitmaster. His father, Paul “Speedy” Lohr, had worked under the tutelage of Warner Stamey. At some point – I believe in the 1990s – Paul renamed his business so that it fit under the umbrella of his dad’s existing restaurant on NC-8. That one is called Speedy Lohr’s of Lexington. Confusing the issue further, Lexington is also home to a completely unrelated Speedy’s Barbecue which actually predates either of the Lohr establishments. Anyway, we were running a little behind schedule at this point, since the detour to Switzerland Cafe had taken far longer than planned. We made up a little time on the interstate, and we got to Speedy Lohr’s – the Arcadia one – about 3.25 for a small snack. Marie passed on anything here since she was planning to dig in at the next stop. Our son only wanted some fries, and so we were well under budget here. I had a tray of chopped pork and red slaw with a Cheerwine. The usual line is that Piedmont or Lexington-style sauce is vinegar-based with a little ketchup. Speedy Lohr’s seems a little thicker than most in the region, and they put a little more sauce over the pork in my tray than I’ve had at other places. They have a hot version of the sauce as well for the table, but there was already so much sauce on the pork that it didn’t need any more. Still, even though the pork was a little oversauced, it was still very good and I enjoyed it a lot. I could really taste the smoke, and it just melted in my mouth. The slaw was delicious. Marie smiled and said that she prefers mustard slaw. Well, me, too, but red slaw is a pretty close second. 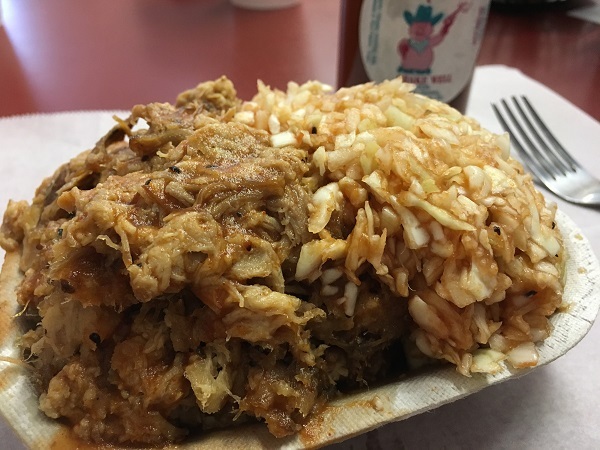 Posted on November 18, 2016 by Grant G.Posted in barbecue, north carolina, piedmont triadTagged barbecue, lexington, ncbs historic barbecue trail, north carolina.